The finish line for the New York City Marathon, so orderly and secure throughout the morning and afternoon, resembled a carcass by Sunday evening as workers began to strip away its decorative features. A red truck slowly backed over the line, and employees hopped out to disassemble signs. 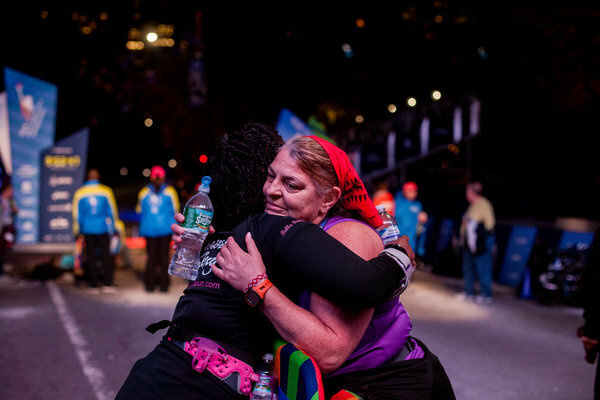 At 7:30 p.m., Sala Cyril, a 38-year-old woman from New York, trotted across the line, 8 hours 28 minutes after she had started the marathon. Greeted by family, friends and volunteers, Cyril placed 49,466th. She was celebrated as the final finisher with a recorded time. “I did it!” she said. Seconds later, race officials erected a small orange barrier along the finish line and placed traffic cones in front of it. The marathon was essentially over, and a new, less ceremonious stage had inadvertently taken shape — one for the first runners to arrive at the finish after the official time cutoff. They had missed the 7:30 p.m. deadline by several strides. They were Shari Diaz, 32, of Hempstead, N.Y.; Wicki Ball, 55, of London; and Kendra Sandman, 54, of Baltimore. Their results would not count. They did not seem to care. “We should be given an award for that,” said Diaz, a first-time marathoner. Diaz was coming off the Queensboro Bridge, at around Mile 15, when she joined up with Ball and Sandman. They were all traveling at the same pace, with the same attendant suffering. They did not know one another. They bonded immediately. 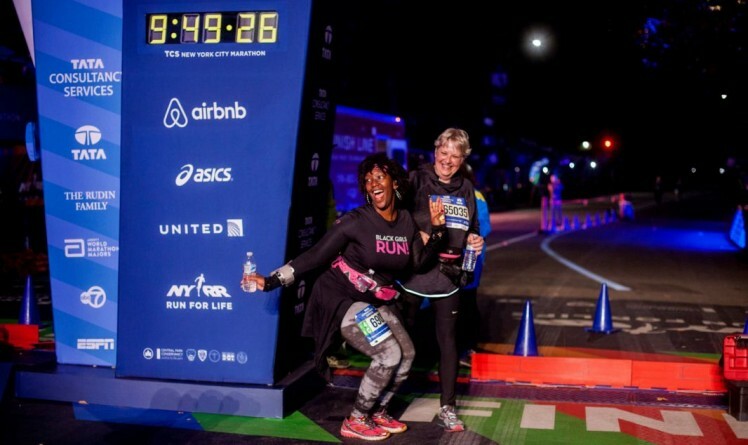 Nearly nine hours after they took their first steps across the Verrazano-Narrows Bridge, the runners — all of them official entrants — approached the finish in Central Park. It was dark. Police officers and race volunteers outnumbered spectators. The traffic cones had been placed in front of the finish line, for reasons that were unclear to Diaz at the time. Trailed by Ball and Sandman, Diaz hopscotched past the cones and delighted in her achievement. “My socks are probably full of blood,” she said. Ball peered at her own sneakers. “I don’t think I have any toenails left,” she said. Only then was it brought to their attention that they had finished first — first, that is, in the Almost category. Ball, who had traveled from her home in England to cross the marathon off her bucket list, said she planned to enjoy a nice dinner. 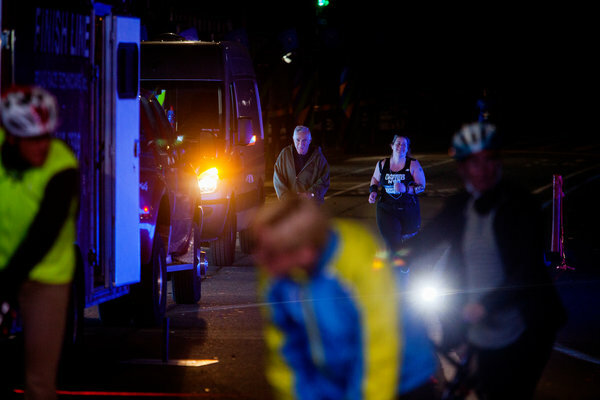 The three women were reliving their experiences when they turned to see another familiar face cross the line. Cristina Canonico, an Italian, had joined the group for several miles. A couple of hours before their arrival, music pumped through oversize speakers as a pair of M.C.s led cheers for finishers who had been out on the course all day. The crowds were beginning to thin. Most of the weary-looking marathoners jogged. Some walked. Many lumbered. Others limped. “It’s time to get your finish on!” one of the volunteers shouted. An hour later, the grand stage was in pieces, though dozens of volunteers remained. The late arrivals were led by Diaz and Ball, who finished first and second — or was it 49,467th and 49,468th? Ball, who manages examinations for a high school, has a daughter who lives in New York, but Ball advised her to stay home on race day. Ball seemed to anticipate that it would be a grueling experience. “I didn’t want her to have to pick me up in a wheelbarrow,” she said. Diaz had been training with a group called Black Girls Run. After watching several of her running buddies complete marathons, she felt inspired to give it a shot, too. On Sunday, several members of the group awaited Diaz’s arrival at Mile 16. Diaz said she was so overcome with emotion that she teared up. “She needed a minute alone,” said Sandman, a college professor. Even as late afternoon turned into early evening, the streets were lined with spectators. Children offered high-fives. Because most of the aid stations had been shuttered by the time Diaz and her compatriots arrived, often jogging or walking by that point, spectators offered food and beverages: bananas and doughnuts, lollipops and water. One woman approached Ball and offered to run to the deli for her. Instead of being miserable, Sandman said, they decided to have fun. They talked about their families. They enjoyed the scenery. Sandman’s GPS watch died. They took at least one wrong turn, traversing an extra block. Had they stayed on course, they probably would have made the official cutoff. “It was dark!” Sandman said. At one point, Diaz’s husband, Christian, and her young daughter, Bella, popped up on the side of the road with hot pizza. “She wanted mommy to finish,” Sandman said. They all dreamed of their guilt-free postrace meals. Diaz told her new friends that marathoners burned the caloric equivalent of 24 cupcakes, which led one of them to suggest that race officials put cupcakes at every mile marker. Maybe next year. Diaz said the entire experience had made her love the city even more. She was asked if she would enter another marathon. She turned to Sandman and Ball. “Only if these guys are doing it, too,” she said.